We previously wrote about the most livable cities in the world and the most innovative solutions to make cities more livable. Now we bring you the smartest cities in the world, courtesy of Boyd Cohen of Co.EXIST. Cohen explains that some people choose a narrow definition for smart cities, but he prefers a broader definition, encompassing cities that use information and communication technologies to be more efficient in the use of resources. This can be a result in energy or cost savings, improved service delivery or quality of life, or reduced environmental footprint. Cohen previously released his research on climate resiliency, which culminated in a global ranking of climate resilient cities. Here are the top two in Cohen’s list of smart cities, with a bit of insight from us into how these cities are incorporating technology into their transportation systems. You can find the remainder of Cohen’s smart cities here. With a population of nearly 2.5 million people in its greater metropolitan area, Vienna is the largest city in Austria. 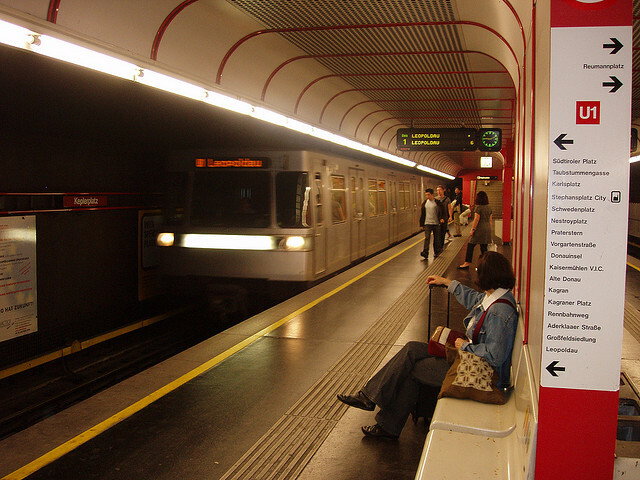 Its metro system sees 1.3 million passengers every single day and it is the best performing public transport system in the entire world, according to the International Association of Public Transport. With a combination of policies aiming to integrate urban and transport planning, and shifting traffic to environmentally-sustainable modes of transportation, Vienna significantly increased its modal share for public transportation. In 2010, for example, Vienna’s modal share was split 28 percent for walking, 5 percent for cycling, 36 percent for public transportation and only 31 percent for private cars. In the meantime, the city has taken on a list of measures to improve sustainable transportation, like developing public transport infrastructure, improving public transport quality and image, enacting stringent parking space management measure for commuters, and improving conditions for pedestrians and cyclists. Vienna achieving the number one place as a smart city is not just a local effort, but a national one. One specific example of how Vienna, as part of Austria, is a smart city is the Federal Ministry for Transport, Innovation and Technology’s investments in e-mobility. E-mobility is the intersection of environmental protection and individual mobility. The ministry invests in key technologies and supports Austrian researchers and companies in their development and implementation of future-ready transportation technologies. The city recently launched the Smart Commute program, which works with businesses to reduce traffic congestion, improve air quality and take action on climate change by encouraging the use of sustainable transportation options. On the program’s website, you can find partner businesses and learn about sustainable commuting plans, or you can join a free online service that gives you access to others who have signed up to carpool. Through its partnership with businesses, the program also offers discounted transit passes, emergency rides home, shuttles, vanpools and active commuting alternatives. As of 2006, the city has a cycling mode share of 1.7 percent and they recently launched a bike-share system. The city has also been incorporating transit customer communication systems to eliminate the element of surprise in transit arrival. The Subway Information Systems provide information on bus and streetcar routes, full-screen over-rides in the event of a major subway disruption, planned route diversions, last train departures and safety information. The city is also using text messaging to alert customers on the arrival of streetcars. Finally, Toronto is also using open data, allowing developers to take advantage of the transparency and build tools that will bring innovation to the city.